I don't have a lot of time, I have to catch a plane. This clip will have to speak for itself. I'm hoping that John Cooper will be so kind as to fill us in with some more information on this one. 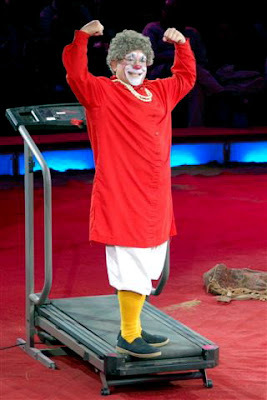 Photos from American clown Barry "Grandma" Lubin's recent triumphant run on Germany's Circus Krone. I leave today for an large international clown festival in Liuzhou, China where I'm thrilled at the opportunity to work alongside (and get to watch) dozens of talented performers from around the globe. I will try to keep updating The Alley while I'm away. As an appropriate parting gift, here is Millie Schofield's portrait of Beatty-Cole's Bernie Kallman, entitled "Calling All Clowns". To link to Ms. Schofield's eBay site, please click the title of this post. CLOWN ALLEY: Ringling at the Garden 1920s? A photo that looks to have been taken at the old Madison Square Garden, probably in the 20s, at a PR event with "non traditionally or differently-abled" children. The ringmaster at right looks to be the legendary Fred Bradna and I'm not sure but the little clown on the left looks to be a very young Frankie Saluto. Paul Jung wasn't the only clown with an Army Gag way back when. Even though his was VERY widely imitated in America, this one is entirely different and doesn't seem to reference it at all. I do have to say that, as good as this one is, I think Jung's had a MUCH better blow-off. The alien/boogeyman just doesn't compare with loading Prince Paul into a canon and firing him up into the rafters. One day I'd like to take Jung's gag. this one, Abbott and Costello's and the one Joe Besser did in Olsen & Johnson's show SONS O' FUN and combine them with new material to create an "ultimate" military style gag. But then, how would I do it when most producers never hire more than one clown anymore? And does anyone know if Francesco, who is back in France recovering from a surgery while his son covers for him on Big Apple, is related to these Francescos? Anyone know how Francesco is doing? I'm hoping that he's doing well and will be able to return by the end of the season. New York Downtown Clown is proud to present the ONLY Clown Awards Show in North America- The New York Downtown Clown Golden Nose Awards. This first-annual event will honor Clown Excellence from performances of the New York Downtown Clown Monthly Revue’s inaugural year. In addition to the awards presented, the evening will include performances by nominees, dance numbers, door prizes, red carpet, and audience participation games with prizes. 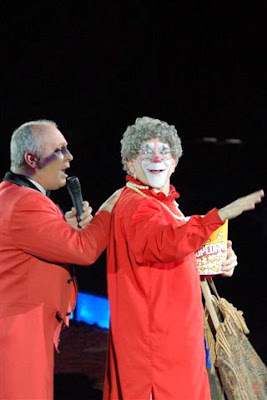 The show will also feature Clown Superstar Presenters, including Barry Lubin (Grandma- Big Apple Circus) and Hovey Burgess (The Father of the New Circus Movement). The Golden Nose Award Statues will be designed and created by Clown Nose/Mask Maker, Stanley Allan Sherman (creator of the WWF Mankind Mask). The Producers of Slava’s Snowshow (David Foster and Ross Mollison) will receive the Clown Achievement of The Year Award for running the show for two record breaking years off-Broadway. This is the First Clown Awards Show in NYC and the only one in North America. Well' the only one CURRENTLY in America. 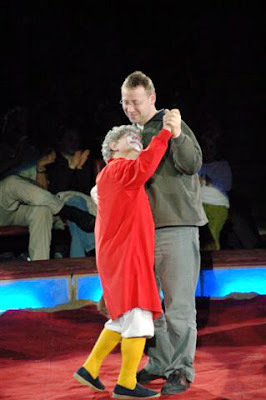 For more on the New York Downtown Clown Monthly Revue, please click the title of this post. 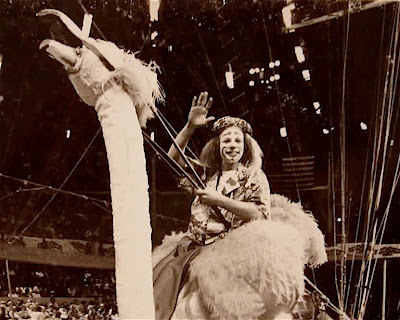 A great clown, a great puppeteer and a great dinner conversationalist, Mr. Christopher "Hoot" Hudert on the Ringling Red Unit during Gunther Gebel Williams' Farewell Tour. For more on Mr. Hudert and his company APPLAUSE UNLIMITED, please click on the title of this post. After a long career in vaudeville Chaz Chase sort of dropped out of sight in the 1940s, only to re-emerge in the 1950s as a sought-after guest on many television variety programs. This mid-60s clip tells us that he was working in European circus during that time and I've recently found out that his final two appearances were on Late Night with David Letterman shortly before his death in 1983. Frank "Slivers" Oakley, the single greatest and most influential American circus clown of his generation, has been languishing in an unmarked grave in NYC for almost 100 years now and it's high time someone gave the man a marker befitting his enormous contributions to American circus clowning. That someone really should be us. So I throw this open to the floor: Does anyone have any suggestions on how to best raise the funds necessary to get Slivers a really world class monument? I'm open to any and all suggestions on this one. If this project is successful there are two far more cheerful and less expensive ones that I'd like to embark on before year's end. After the era of Slivers Oakley, Spader Johnson, Al Maico and Buck Baker guys like Bluch Landolf, Paul Wenzel, Jack LeClair, Felix Adler and this man, Gijon Polidor, were central to the Ringling Alley before the well known JRN-era Alley lead by Lou Jacobs, Emmett Kelly, Paul Jung, Paul Jerome and Otto Griebling. 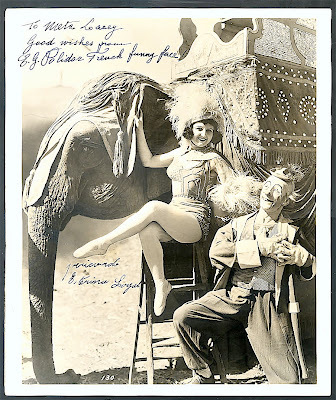 Here we see Gijon (I've been told he was Belgian despite the "French Funny Face" of his signature) as one of the three classic elements of good circus promotion: Funny Clowns, Pretty Girls and Elephants. Sadly, this photograph couldn't be taken in Connecticut today. I'm hoping some of the European folks could help me out with the name of this act? It's from a 1960s French video and I can't make out the performers' names from the introduction. The greatest knockabout comedy act in the history of vaudeville, Willie, West & McGinty in their Paramount short PLASTERED from 1930. Irvin Feld missed a very narrow window of opportunity in the late 60s to recreate this act when the Ringling circus featured three clowns who would have been dead ringers for WW&M, Michael Karp, Doug Ashton and Freddie Freeman. Avner's show the other night with Mark Jaster seems to have put everyone in an Avner frame of mind and "Avner-mania" is running rampant across the country. But why talk about him here? 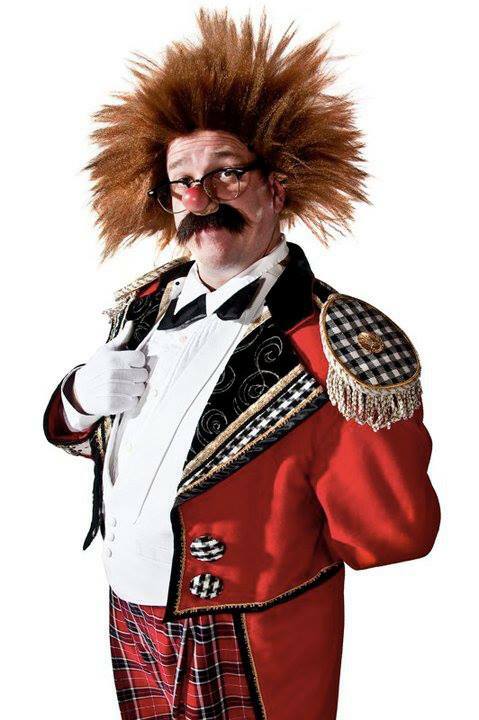 This is a forum for circus clowns, not "New Vaudevillians". There is a lot more circus-style clowning to Avner than one would expect. 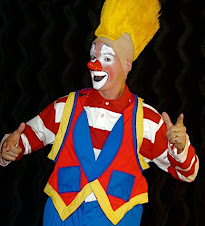 While he may not wear the wig, big shoes or emerge from a tiny car that audience still associate with circus clowning in America, I don't think he'd be at all out of place on a show like Circus Flora or Big Apple. It's actually suprising to me that he HASN'T toured as the "featured clown" with a one-ring "New American Circus". 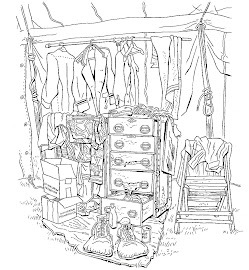 He's mastered virtually all of the manditory "New Circus" skills in Hovey Burgesses' CIRCUS TECHNIQUES and I think that his unique character would really flourish outside the strict confines of the procenium stage. 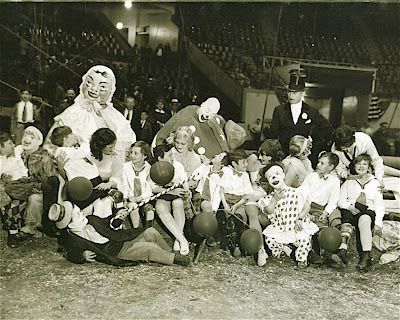 Bill Strong sent along these pictures from a time long ago and far away when Avner still linked to circus clown tradition via that smallest of masks, the red nose. He has since dropped it, and I think it's for the better. 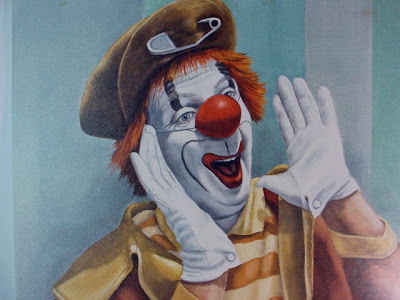 His face is more than expressive enough to convey the idea of "clown" without any help from makeup or noses. 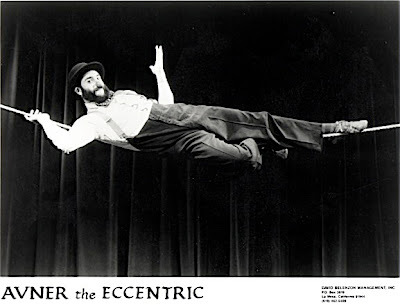 The promo video for Avner's show EXCEPTIONS TO GRAVITY. 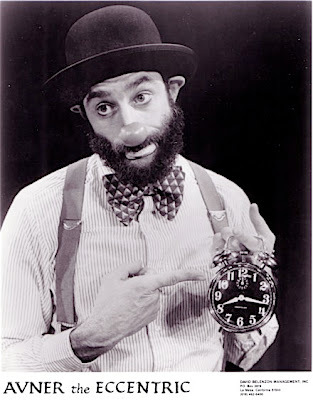 It strikes me that Avner's show is actually closer to what people are trying to describe when they talk about the "New Vaudeville" performances of Bill Irwin. Irwin's shows are uniformly brilliant, but I think owe more to the Commedia tradition and silent film comedy than to vaudeville. There are bits and pieces that bring to mind previous vaudevillians such as W.C. Fields, Chaz Chase, George Carl and many others but they are all being channeled through Avner's unique and very distinct persona and style and morphed into something original and new. Avner could be working today, tomorrow or 90 years ago, anywhere on earth, and would still be considered a legendary vaudeville comedian. 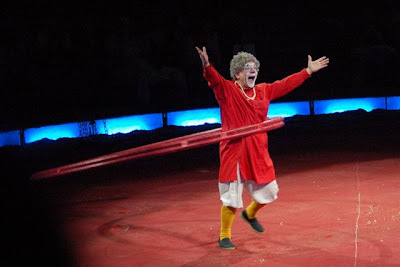 Here's Paul Lopez, a very talented young clown that I worked with last season on Mike Naughton's Yankee Doodle Circus, performing Giovanni "Nino" Zoppe's hat and broom routine on the Zoppe Family Circus in Racine Wisconsin in the summer of 2006. 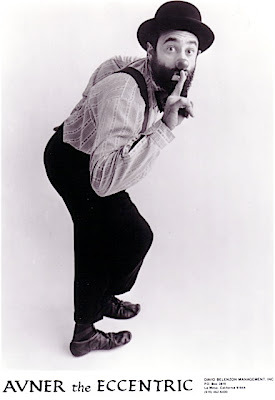 Gordoon taught the chair gag to me, I taught it to Paul.